Monastic architecture is often spectacular, an attribute seemingly at odds with the ascetic lifestyle of its adherents. Time is a harsh mistress and after centuries of war, religious strife and natural disasters, only the strongest – and strangest – have survived. For that at least, we may be thankful. 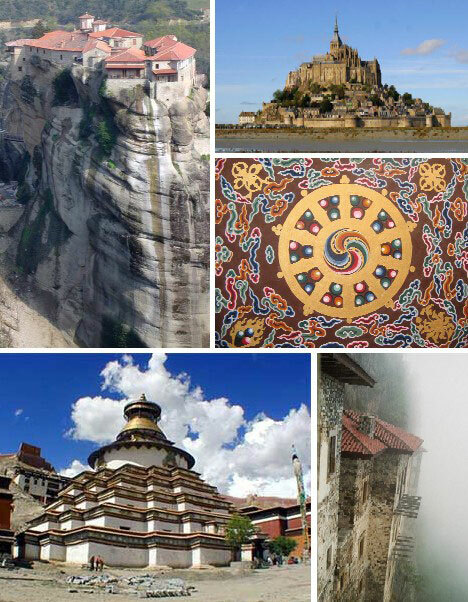 Meteora means “suspended in air” in Greek, and that’s an apt description for these centuries-old monasteries. 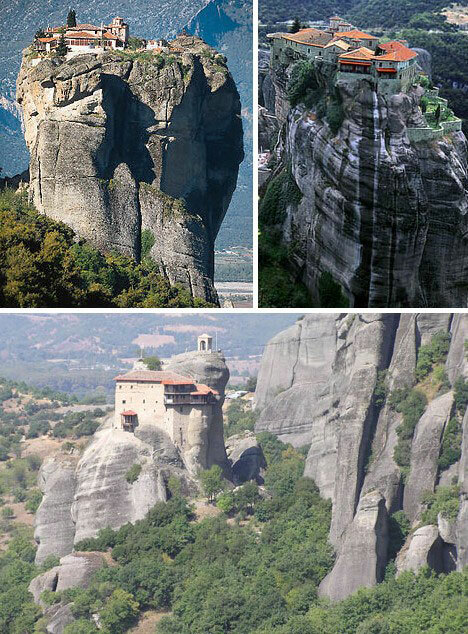 Perched atop 1200-ft tall crags of Thessaly’s “Stone Forest”, as many as 24 separate monasteries thrived during the area’s heyday in the 14th century. Today only a half-dozen are still active. Today tourists – not rampaging Ottoman warriors – are the main visitors to this stunning setting in northern Greece. The Taktsang monastery in mountainous Bhutan is one of Buddhism’s holiest – and most beautiful – places. Said to have been constructed in the 8th century by a holy man who flew to the site on the back of a flaming tigress. 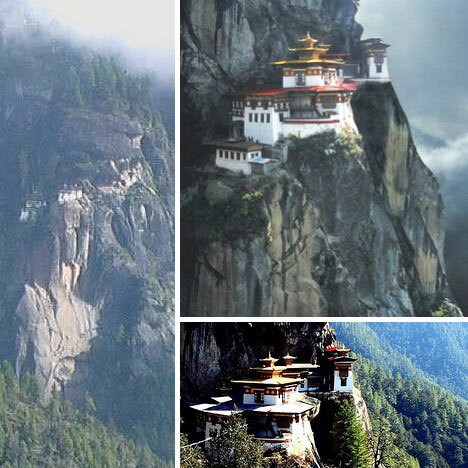 Taktsang is known as the Tiger’s Nest. Looking at the complex, perched upon a sheer cliff nearly 2,000 feet above the Paro river valley, one begins to believe the ancient legend just may be true! Taktsang can be considered a work in progress as new buildings continue to be added to the complex, the most recent in 1982. 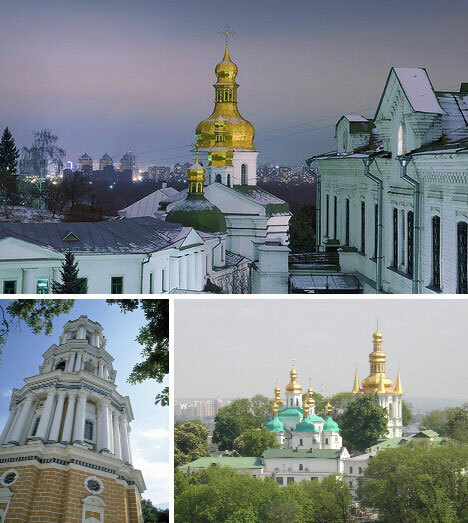 Kiev Pechersk Lavra, or the Kiev Monastery of the Caves, is a huge complex of spectacular buildings in the heart of Ukraine’s capital, Kiev. Originally established in the year 1051, the monastery was destroyed by the Mongols twice: in 1240 and again in 1480. In the centuries following, the complex grew both in size and in wealth, gaining its brilliant golden domes that are its trademark. 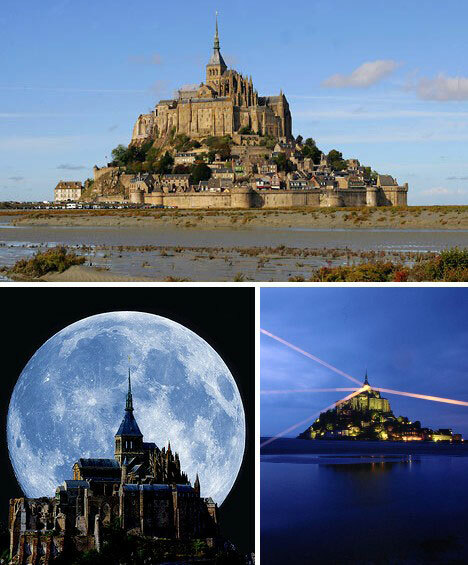 Mont Saint-Michel is a “fortified abbey”, and it sure does look the part! Construction on the site began in the year 966, when the abbey’s location was a rocky island protected from land-based marauders by Europe’s highest tides. Marsh drainage and construction of a causeway in the 19th century disrupted the natural flow of water, allowing silt to gradually surround Mont Saint-Michel on three sides, but a reclamation project now underway should restore the abbey’s isolation by the year 2015. 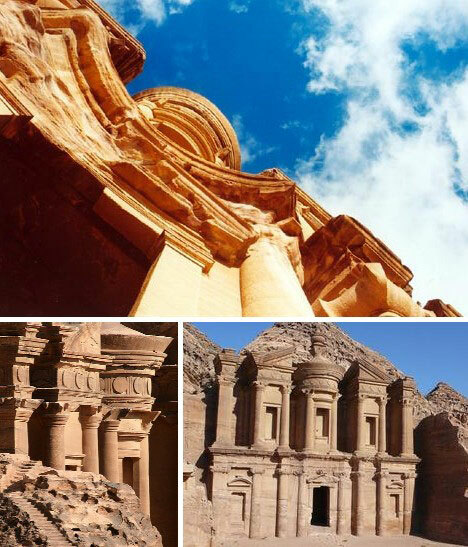 This 150ft tall building in the ancient Nabataean city of Petra, Jordan, was laboriously carved out from the red sandstone canyons over 2,000 years ago. It resembles it’s more famous neighbor, the so-called “Treasury” so prominently featured in the 1984 film Indiana Jones and the Temple of Doom. Curiously, both the Treasury and the Monastery are nothing of the kind – their true purposes are still unknown. Nestled in the lush, monsoon-drenched foothills of the mighty Himalayas in northern India lies the Rumtek Monastery. Home to monks of all ages, even boys such as the one pictured above, Rumtek revels in bright colors set off with the glint of gold. 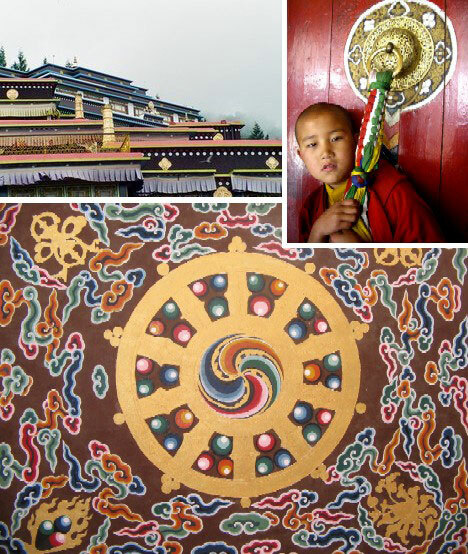 The glorious mandala above graces the ceiling of a porch leading to Rumtek’s main temple. 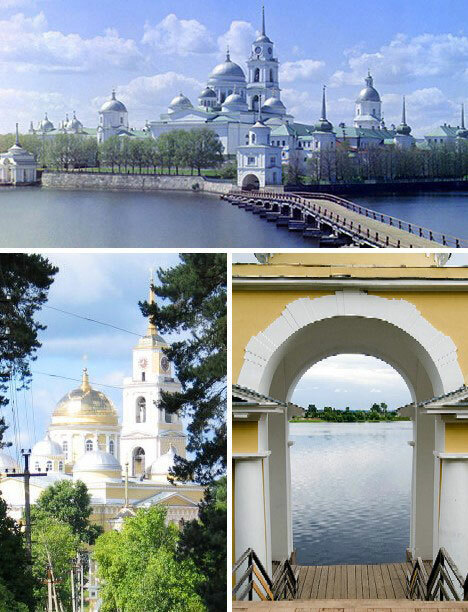 Sergei Mikhailovich Prokudin-Gorskii took the above (upper) color photo of the Nilov Monastery in Tver, Russia, in 1910 – before there WAS such a thing as commercial color photography. The process used by Prokudin-Gorskii to create magnificent images like this one was so complex, Czar Nicholas II gave him a fully equipped railroad car with which to travel through Russia and document its most iconic sights. 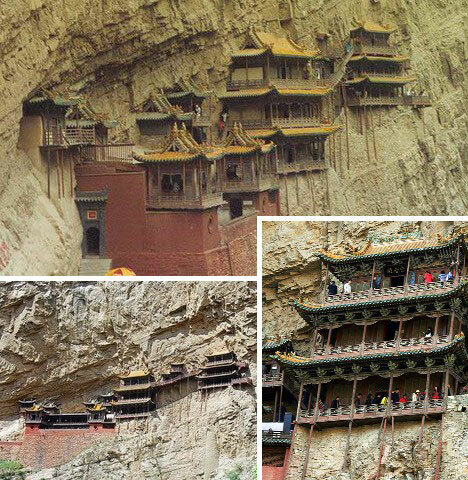 Xuan Kong Sì was built into a cliff face near Mount Heng in Shanxi province, China, about 1,400 years ago. HOW it was built, is anyone’s guess. Although it may look rather fragile, the Hanging Temple has hung in there through dozens of severe seismic events including the deadliest earthquake in recorded history: a 1556 temblor in which up to 830,000 lost their lives. 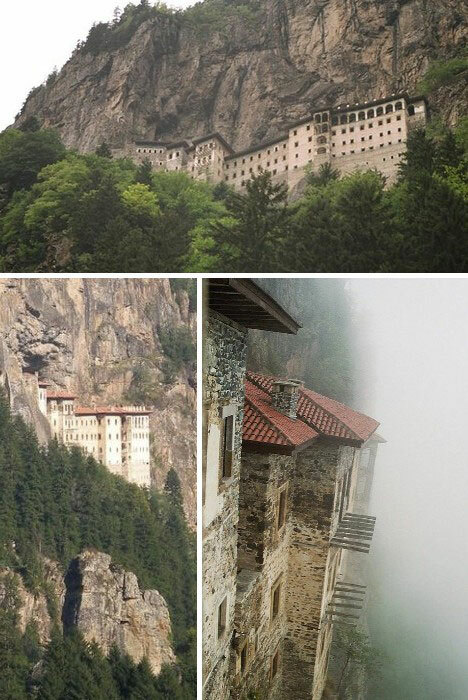 Another cliff-hanging sanctuary, Sumela Monastery in the Turkish province of Trabzon (Trebizond to the ancient Greeks and Byzantines) dates from the year 386. As the story goes, a pair of priests journeying eastward from Athens thought the steep cliff overlooking the Alt?ndere valley would be a good place to set up a monastery. One can only imagine what they thought a BAD place would be. Nonetheless, their choice ensured that Sumela Monastery would be a tough nut for invaders to crack – much more likely they’d be cracking their skulls on the rocks below. 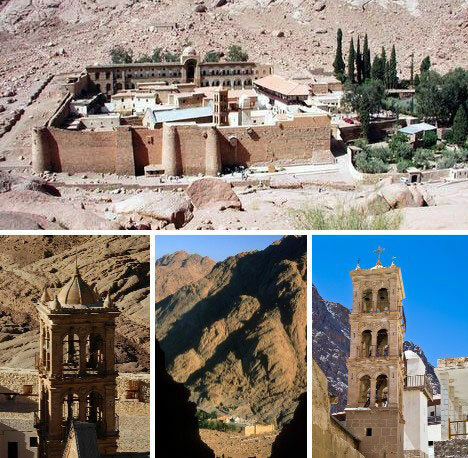 One of the oldest Christian monasteries in Egypt, if not the world, the Monastery of St. Catherine near Mount Sinai dates from the earliest years of the faith. The roots of monasticism itself can be said to have sprung from the stony soil of the Sinai. The monastery was sponsored through the ages by kings and emperors from distant lands who saw it as a foothold of faith worth protecting. Today its still formidable walls, built by the Byzantine emperor Justinian in the 6th century, are in remarkably good condition. 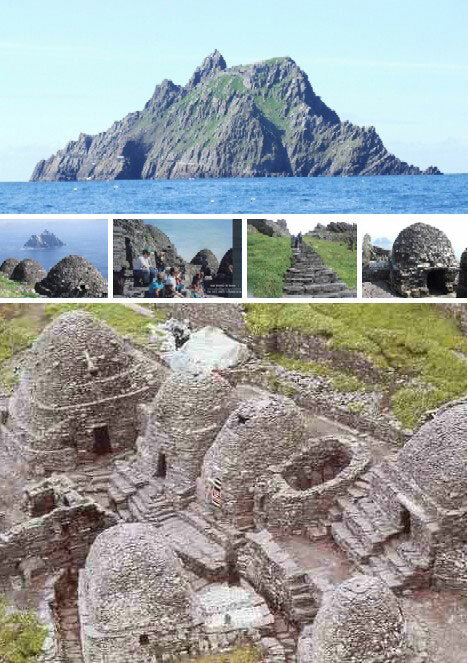 Skellig Michael, an inhospitable rocky island 10 miles off the coast of County Kerry, Ireland, is one of Ireland’s oldest and most famous monasteries. The long-suffering monks, rarely more than a dozen or so, lived in cold & gloomy “beehive” huts made of stone from the year 588 to sometime in the 12th century when they moved to the Irish mainland. One wonders whether the Khor Virap monastery in western Armenia has ever been used as a movie location setting. 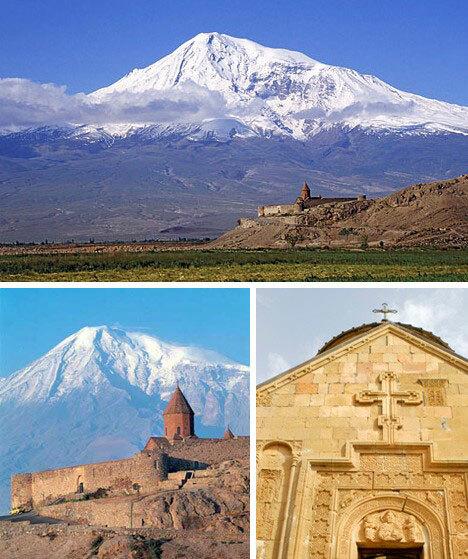 The ancient walled monastery sits alone in an otherworldly setting dominated by the massive bulk of snow-capped Mount Ararat, said to be the final resting place of Noah’s Ark. Khor Virap also houses the dungeon used to imprison Saint Gregory, considered the founding saint of Christian Armenia which dates from the year 301. 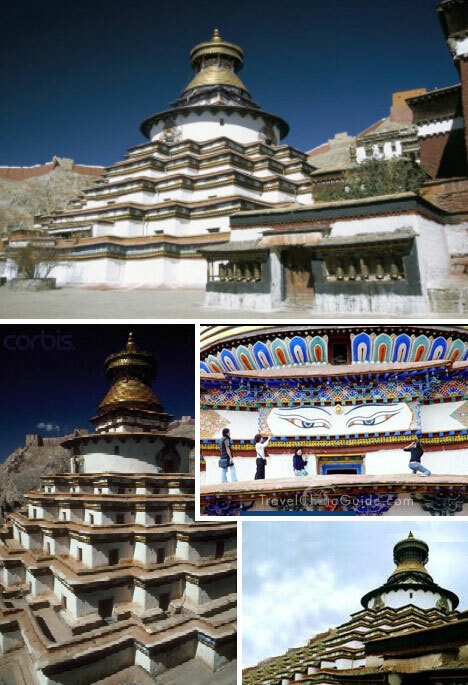 One of the most distinctive of the many Tibetan monasteries, Palkhor was built in the late 14th century near Gyantse, Tibet. The pagoda-style main building is 9 levels (about 100 ft) high and contains over 77 individual chapels and shrines. 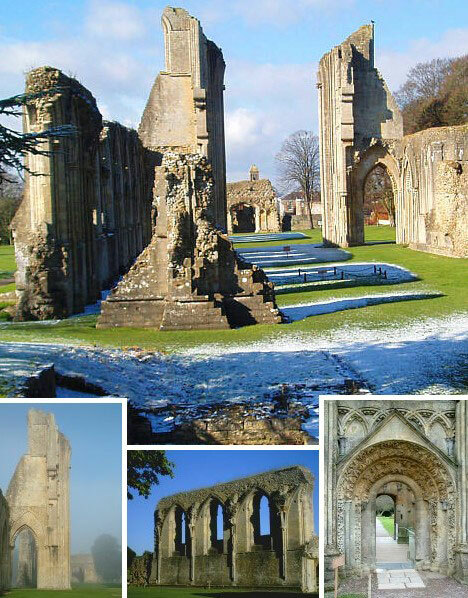 Glastonbury Abbey was already more than 350 years old when William the Conqueror won the Battle of Hastings and by 1186 was the richest abbey in the realm. King Arthur and Queen Guinevere were said to be buried in a place of honor before the church altar. 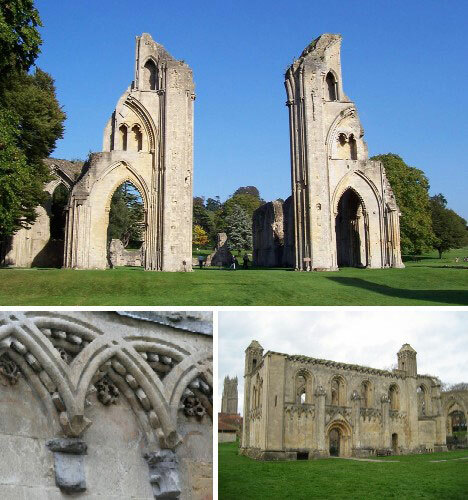 In the 1530s when King Henry VIII solidified his position as head of the new Anglican Church, Glastonbury Abbey was looted and destroyed – the greatest and final act in what is now referred to as the Great Dissolution of the Monasteries. Though little remains of Glastonbury Abbey and its associated buildings today, enough still stands to hint strongly at its former glory. 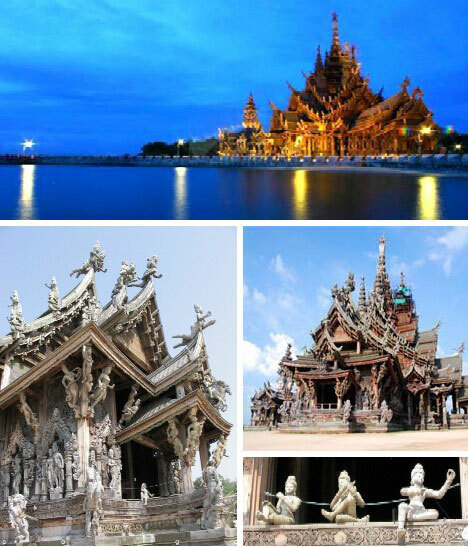 The Sanctuary of Truth in Pattaya, Thailand, is made entirely of wood and is styled to resemble ancient Buddhist temples such as Cambodia’s Angkor Wat. Though it may look old, it isn’t – the sanctuary was begun in 1981 and the entire complex is expected to be complete by the year 2025. What kind of person decides to build a 315ft tall religious sanctuary? Lek Viriyaphant, for one, a Thai millionaire said to be somewhat eccentric. As for the future, who can say? As long as humanity seeks answers that his own science, logic and common sense cannot provide, there will be a need for monasteries, abbeys and sanctuaries where such things may be contemplated in peace, quiet and inspirational surroundings.